How about that "hummm"? Electrostress? This book has many stories throughout its pages – some are profoundly moving, highly emotional, others dry, legalistic and intriguing – but it has one powerful, overriding and urgent message: People are being killed and some becoming very sick as clusters of cancer appear in Australia and many other parts of the world caused by Electromagnetic Radiation – Silent Fields in small but lethal doses. Once again as the pollens start to poor into our local environment I hear the complaints of our good old friends, sinusitis and rhinitis, conditions associated with allergies and hay fever. Even worse is the experience of those who have food allergies that are compounded with the addition of pollen overload. Common allergy foods include, wheat, dairy products, fruit, sugar, yeast, mushrooms, egg, soya, coffee, corn and even greens. I will also mention here the 4 "C's" that we see often associated with an individuals response to a food intolerance, these are Coffee, Cheese, Citrus and Chocolate - anyone experience headaches after indulging in any of these? A simple test that you can learn to test foods you suspect is the Pulse Test. When you eat food that you are allergic to, there is a dramatic increase in the heartbeat - 20 or more beats per minute above your normal. The pulse rate is generally stable and unaffected by digestion or ordinary activities. Unless a person is ill or under a great deal of stress, a pulse rate deviation is highly likely to be the result of an allergic type reaction. By using the pulse test one can find and obviously eliminate harmful foods. Pulse Test - The procedure: Take your pulse when you wake in the morning, count and remember the number of beats per minute. Take your pulse again immediately after eating a suspected food just to make sure you know where things are. Then after 15 - 20 minutes take your pulse again - if the pulse rate has increased by 10 beats or more per minute you would be wise to omit that particular food from your diet. It sounds simple, and it is, but this simple method has helped many people solve food related problems, give it a go. As for the treatment of hay fever or sinus problems, we have a couple of exceptional products that we have used over many years. Yes, three more products from the Heel range out of Germany. Both of the Heel Nasal Sprays act as a decongestant but each has specific target areas of the respiratory tract. The first is Luffa Comp.-Heel and it acts mainly in the deeper, lower respiratory tract while the other - Euphorbium Comp Nasal Spray, targets the sinuses and upper respiratory structures. Luffa Comp = Hay fever, congestion from allergies and Asthma. Euphorbium Comp = Sinusitis, Rhinitis, congestion from allergies. 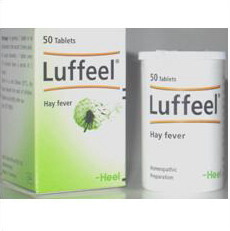 Luffeel Comp = homoeopathic tablet that can be used as a prophylactic or to help with acute cases of hay fever. As well as helping to normalise the mucous membrane, the Euphorbium in particular even has demonstrated in studies to have antiviral properties, what a great product! If you know you are likely to get hit at certain times with various pollens, the Luffeel and/or Luffa Comp has been used with good effect as a preventative medication, the companion product in a small dis-solvable tablet that will enhance the bodies ability to deal with hay fever and assist with stimulating the elimination of airborne contaminants such as pollen, Luffeel is best used together with the Luffa Comp nasal spray for more stubborn hay fever. Red Bull Can Give You a Stroke.Wow, what a bargain! Just one can of the popular stimulant energy drink Red Bull can increase your risk of heart attack or stroke. The effect was seen even in young people. The caffeine-loaded beverage causes blood to become sticky, a pre-cursor to cardiovascular problems such as stroke. One hour after drinking Red Bull, your blood system becomes abnormal, as might be expected from a patient with cardiovascular disease. Red Bull is banned in Norway, Uruguay and Denmark because of health risks. Do you really want this type of "support" to get you through the day? For those of you who may be in and around Taupo next weekend come along to the ECOSHOW NZ, this is the second time this event has been held in Taupo and is a showcase of everything Green, sustainable and of course Organic - we will have a display of the Miessence products and would love to see you. As we have mentioned the highly effective Heel products for dealing with sinus or hay fever we are happy to offer a 10% discount off any of the 3 mentioned products, and we will even send them freight free. As an example - order the Hay fever duo of the Luffa Nasal Spray and Luffeel tablets and you will save $12.00!